Rapid advances in Radio Frequency Identification (RFID) technology, in Micro-Electro-Mechanical Systems (MEMS), in lower-power wireless networking and in computation give hopes for a new generation of small, inexpensive, networked sensors that can be distributed on civil and building structures to provide accurate, quantitative information on the structure’s physical state while in service. This information can be used to assess the structural condition of the monitored facility and aid decision making on rehabilitation so that safety can be attained and rehabilitation costs can be reduced. The above integrated package for building monitoring and assessment will promote ‘Proactive Condition-Based Maintenance’ which is based on measurements aimed at an early detection of degradation, thereby allowing degradation to be eliminated or at least controlled prior to significant physical deterioration. The result is a significant decrease in maintenance cost, because problems are less expensive to fix when they are first developing, and an increase in building safety. The impact on safety will be more pronounced in the case of an earthquake where it is essential to have an accurate and quick assessment of the building structural condition for several reasons: (a) dissemination of information to emergency response officials on building collapses within minutes after the occurrence of the earthquake can result in lives saved and prudent allocation of resources and (b) quick and accurate estimates of the level of damage can be used to indicate loss of function and help officials decide whether the school, hospital, etc., should be evacuated or remain in service. Often such information is delayed due to weather conditions, lack of daylight, inappropriate survey equipment or lack of access to the site due to terrain obstacles. The MEMSCON system is containing two classes of sensors: the 3D acceleration sensor and the 1D strain sensor. The sensors will be integrated with an RFID tag and communicated wireless with a base station. A multitude of sensor nodes (i.e. 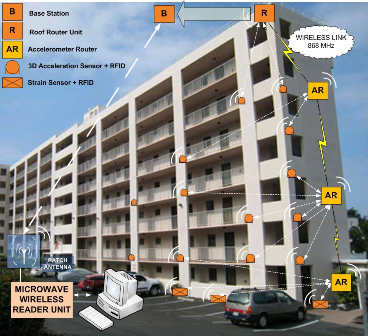 sensor + RFID tag) will be distributed over the building (see Fig. 2) and monitor stress and deformation within the building. Each sensor node will be individually supplied by a battery. In order to keep the required maintenance level low enough, the battery must have a lifetime of at least a couple of years. This requires not only efficient batteries, but demands also power optimised sensors and RFID tags. Sensing and wireless communication will take place at specified time intervals as needed. To assess the progress of ageing, strain measurements will be taken every few months. Power consumption is uncritical in this case. The measurement of acceleration will only take place during earthquakes. As a constant monitoring of the acceleration requires too much power most of acceleration sensor nodes will be kept in a low power mode until they receive a “wake up call”. The “wake up call” will be generated by selected accelerometers within the building: as soon as a certain acceleration threshold is passed at these nodes the entire network will be activated. Compactness and low cost is the main driver within MEMSCON to use MEMS-based sensors. Various MEMS-based accelerometers are commercially available on the market, since a few years also as 3D accelerometers. These sensors have been developed mainly for the consumer market and automotive applications. Although some sensors of the latest generation of of-the-shelf sensors are able to fulfil some of the requirements for the MEMSCON system, the low power consumption is the critical point that cannot be satisfied with these sensors. There are 2 different trends in MEMS technology: monolithic integration and hybrid integration. Monolithic integration allows the fabrication of the MEMS element on the same die with the signal conditioning circuitry (time consuming and very costly approach for product development and/or customisation. This is the approach of the blue chip companies, (mainly in the US), whereas hybrid integration uses the system in package approach (wide spread in Europe and for SMEs). By taking full advantage of batch processing, both approaches result in improved sensor performance and reliability as well as reduced sensor cost in the case of mass-volume production. In view of the limited time window in this project for tag prototyping, and the level of system integration required for the MEMSCON system, the 3D acceleration sensors and the electronics will be fabricated separately. Critical electronic functions will be integrated on an ASIC and assembled close together with the MEMS in one package. Strain gauges provide the technical basis for common systems to measure strains in the monitored sections of constructed facilities. While metallic foil strain gauges are widely used, strain gauges can also be constructed from semiconductor materials. Having the strain gauge fabricated in semiconductor material offer the same processing advantages as for the 3D accelerometer. Moreover, this also allows for choosing the sensing principle and matching it with the accelerometer. By doing so, only one ASIC need to be designed that can be used for both MEMS sensor, further reducing the cost of each sensor. The main challenge in the strain sensor is the combination of a high range: �30’000µ? with a high accuracy: 10??. The advantage of semiconductor material is the possibility of fabricating sensor with high precision and high accuracy. However, semiconductor materials are brittle and therefore not suited to experience large strain. With the freedom that MEMS processing offers, this problem can be overcome through clever designs and the required specification met. The goal of the strain sensor will be to measure the strain in the rebars of the reinforced concrete column of the building. Hence, the installation of the sensors will be made prior to pouring of the concrete. This poses some extra difficulties in the packaging of the sensor because of the harsh environment created by fresh concrete (pH of 14). In addition to this constrain, the package also has to be flexible and stretchable so that it doesn’t interfere with the strain measurements. Finally, due to the fact that the strain sensor will be embedded in concrete, the sensor will be designed into 2 separate packages so that one package, containing the battery and the antenna, can be placed outside of the column for improved antenna transmission/reception and to be able to change the battery. The package embedded in the concrete will be attached to the rebars of the concrete column. The long term reliability of this assembly is critical since it will not be accessible after the construction of the building and therefore must have an extended lifetime (similar as the building lifetime). The general architecture of the DSS under development can be seen in Figure 1. 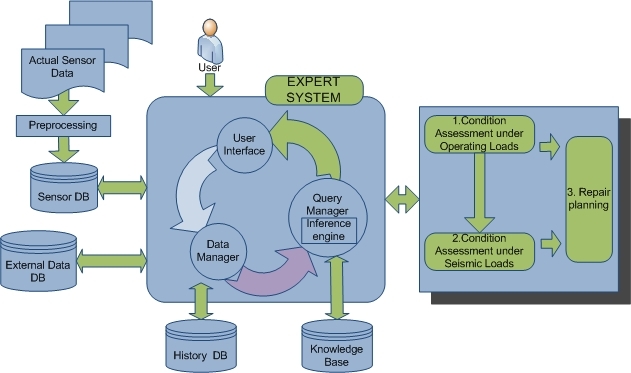 It includes an Expert System that is connected to the Knowledge Base and the Sensor, History and External Data databases and Modules 1, 2 and 3. In Module 1 input on strain in the monitored, critical, locations of a r.c. building will be processed to derive stresses and moments which will be compared to limit values in order to determine the structural adequacy of these critical cross-sections. Based on this and on how loads are distributed to the different members the global structural condition of the building and the possible need for proactive maintenance will be determined. In Module 2 input from the acceleration sensors in a r.c. building during an earthquake will be processed to estimate: Areas where the design ground acceleration has been exceeded; the maximum displacements derived after double integration in respect to time of the monitored acceleration time history that will be compared to the max. design elastic displacements; damage and possible need for rehabilitation. Module 3 will accept input on structural damage from Modules 1 and 2 based on which it will identify the feasible options and the resulting costs for proactive rehabilitation and seismic upgrading respectively. The no. of required sensors can be dramatically reduced when instead of aiming at a direct assessment of the internal forces in each member; some critical global parameters of the overall stress condition are being sought. Then, the internal forces in each structural member as well as their structural adequacy can be assessed through a finite element programme that will accept as input the measured values of the above critical parameters. The analysis will be performed using a commercially available finite elements programme installed in a central processing unit. In the memory of the latter unit models of all building elements together with their initial design values will be stored. Since the reinforcement and the order of magnitude of the internal forces will be known, stage II stiffness of each member will be inserted in the model. Under operating conditions the most common reason for changes in the internal forces during the building life-span is differential settlement between foundations on cohesive soils subjected to consolidation. It is not possible to measure the absolute value of settlements through strain sensors. However, it is possible to estimate the support reactions at the columns’ bottom cross-sections on the foundations, at which locations the strain sensors will only be placed (see Fig. 2). The changes in the values of the support reactions that will be estimated in sequential periodic measurements (say, once every 4 months) compared to the values measured in the initial condition of the building will constitute the input for the finite element analysis. The sum of the measured axial forces on the columns equals the sum of the active vertical loads on the structure. The vertical loads that will be applied on the members in the model will be equal to the initial design loads multiplied by the ratio of the total active loads to the total initial design loads. The assessment of the internal forces and the strength adequacy of the structural members after an earthquake will be performed through a non-linear, dynamic, finite element method of analysis taking as input the recorded time history of the accelerations during the seismic event. Considering the floor slabs as diaphragms undistorted at their plane, for each story, required are the time histories of accelerations in 2 directions perpendicular to each other and 1 rotational acceleration around the vertical axis. With 3D acceleration sensors that will provide acceleration measurements in 3 vertical axis, since there will be no measurement of torsion, use will be made of two parallel accelerometers at the ends of the slab to be able to derive the torsion and the other required acceleration measurements. Two such accelerometers will also be placed at the foundation level. As an example, for the direct assessment of the internal forces in the members of a 6-story building with plan dimensions of 15x15 m2, to which correspond about 16 columns and 24 beams per story, the total no. of members being n=6(16+24)=240, the required no. of sensors will be 8x240=1920. In the case of the 16 columns of the 6 story building in the previous example, the no. of the required strain sensors is reduced to 6x4=64 sensors. For the 6 story building of the previous example, the no. of required acceleration sensors will be 2(6+1)=14. The term ‘rehabilitation’ it taken herein to include repair, retrofit, strengthening and maintenance and it is used interchangeably with these words.